Personally identifiable information (PII) fields: Mark additional fields as PII so you can easily distinguish between PII and other data. Meet users’ right to be forgotten: Remove a user’s PII from ServiceDesk Plus and anonymize their name if they request that their data be deleted. Customizable service catalog view: Customize your service request categories and templates view by controlling the order in which they appear. Export requests from list view: Export all your requests right from the list view page. Health Meter: Get complete information about your ServiceDesk Plus instance in one click. The Health Meter shows information about your installation, configuration, database, system, and license properties. Technician home page enhancements: Add custom widgets to your technician home page. You can add widgets using a URL, create a widget within ServiceDesk Plus using HTML, or even point to an HTML or HTM file on your system. 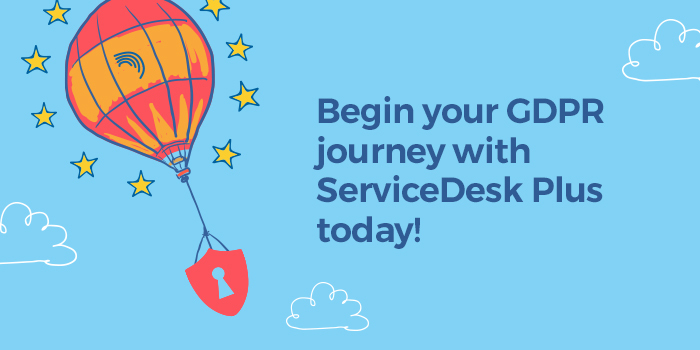 Upgrade to the latest version of ServiceDesk Plus. For more details on the new features and enhancements, please click here. Aside from these new features, we’re also conducting a webinar to help you prepare for GDPR compliance. If you’re interested, please register here.